For the past month, the City conducted an online poll, gathering input from drivers of scooters and motorcycles regarding where they would like to park in the downtown. Given the rise in gasoline prices and environmental concerns, and the fact that many scooters can achieve over 100 miles-per-gallon, the uptick in demand should be followed up with additional services and facilities for this mode of transport. The benefits are immediate: scooters and other lightweight two-wheeled vehicles take up far less room than an automobile. They cause far less wear and tear to roads as they are vastly lighter -- in fact, many can be picked up with two bare hands. They require less fuel, and four-cycle motors pollute far less than automobiles. 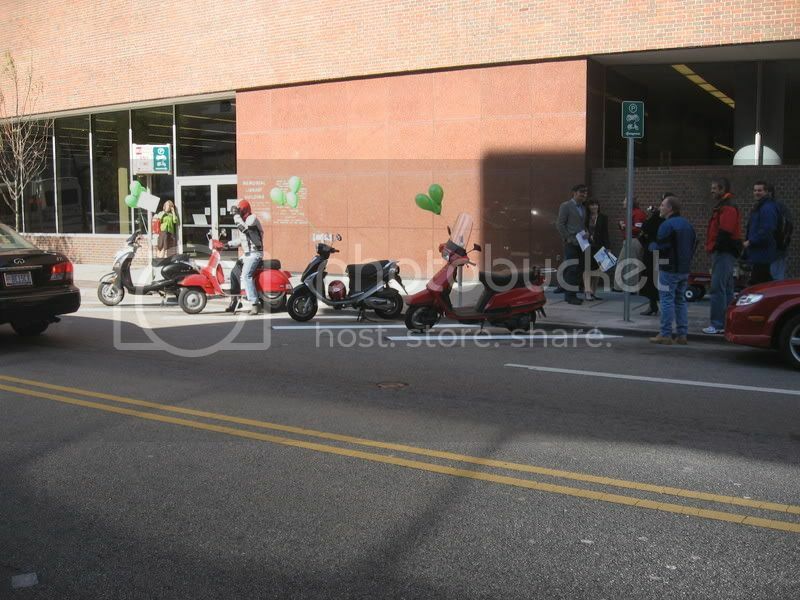 As a result of public input, the city unveiled its first dedicated, public scooter and motorcycle parking in the city on October 23 at the corner of 8th and Vine (GoogleMap) streets in downtown. Noted as the first of its kind in Cincinnati, it will certainly not be the last; four other such locations will soon grace our downtown streets with the hope that the low-cost initiative is expanded elsewhere. Unfortunately, many of these parking spaces look temporary. Painted stripes on the ground and signage on poles may allocate room for parking, but it does little when you pass by it and note a sport-utility vehicle or commercial van occupying the entire strip. Installing low-cost curbs or barriers along the street can solve this issue, and will not only increase safety, but institute a psychological barrier that these parking areas are permanent, and are dedicated solely to the two-wheeled variant. Now only if the city was more proactive in applying the same enthusiasm to bicycles, we would have a much more intermodal city. If you would like to see this program extended to your neighborhood, or somewhere near your business/residence, then please email the City at twowheeler@cincinnati-oh.gov. We in London, England are facing a new problem, we are being asked to pay for parking out scooters and motorcycles yet this has always been free in London, we are campaigning against it and we have had a number of on-street demonstrations, the council will enter a brief consultation on 18th February 2009 as whether or not to make the parking charge or parking tax as we like to call it permanent this will discourage motorcycle and scooter use, this has forces residents to have to pay £150 per year to park their motorcycle outside their own house! but to park their car only costs £80!!!! Please have a look at our website http://www.notobikeparkingfees.com and watch out because once these councils see a way of making money they will soon target scooter riders, even though in a congest urban centre, P2Ws should be encouraged. Thanks for the comment, this will certainly be something we'll have to look out for. Good luck with your efforts.